Looking for a sport WordPress theme? This is a collection of the best WordPress sports themes designed for sports clubs, sport magazine and news websites, sport blogs, sport team websites, sports news portals and other sport related websites. If you want to build a news or club website for football, basketball, soccer, rugby, baseball, cricket, tennis, hockey, netball, cycling, golf, motor racing, snow skiing, or any other sport you could use one of the WordPress themes below. Some of the themes include specific sports related functionality and options to display and manage fixtures and results, player profiles and statistics, league tables, scoreboards, post picture and videos, manage events and more. MH Magazine is a highly flexible WordPress magazine style theme with lots of great features for easily creating a modern and professional online magazine, blog, news site or other editorial project. The Sports Magazine version of the theme is ideal for online sports magazines, sports events or sport clubs to share the latest sport news, sports discussion, matches and results. The premium theme is fully mobile responsive and SEO optimized and includes lots of great features such as: advanced layout options with full control over your layouts, easy to use theme options, custom widgets, color pickers with unlimited color options, Google fonts, content sliders and carousels, custom logo and menus, advertising areas, social ready and much more. SportEdge is a feature packed magazine WordPress theme from ThemeFuse ideal for sport magazine sites. The premium theme has a sharp and modern design that looks and feels like a real website, not a basic WordPress blog. Features include a large dynamic homepage slider, bold typography, custom headers for each category, integrated live scores from ScoresPro, auto image resizing, powerful admin options and more. MH Magazine is a highly flexible WordPress magazine style theme with lots of great features for easily creating a modern and professional online magazine, blog, news site or other editorial project. 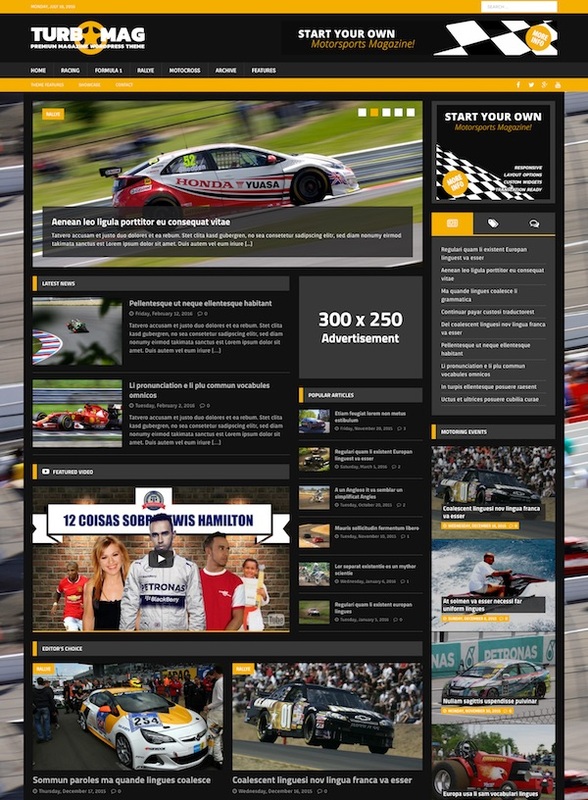 The Motorsport Magazine version of the theme is ideal for all sorts of motorsport websites, car racing, motocross, motorbikes, rally or any other kind or auto or action sport. The Football Club WordPress theme is a professional sports WordPress theme from ThemeBoy – a company that specializes in building advanced WordPress products for the sports community. The theme is mobile friendly and designed specifically for soccer / football clubs from professional to amateur leagues. It’s powered by the free SportsPress plugin that provides all the advanced sport and league management functionality. The SportsPress plugin includes functionality for: Fixtures and Results (manage upcoming events and the latest results), League Tables (create dynamic league tables that will automatically populate data based on the results after each game), Players and Staff (create profiles of players and staff with pictures, flags, numbers, position, and individual stats which are automatically updated after each game), and a Equation Builder (design your points system with pre-sets for common sports or create your custom functions to calculate accurate statistics using the intuitive equation builder), Translation Options (36+ languages) and more. Some of the other features of the Football Club theme include: WordPress customizer support for customization (add you logo, change colours etc), 15 default header styles, custom shortcodes (too add fixtures, results and standings tables, player lists, staff profiles, venue maps, contact forms, match details and image rotators anywhere), add sponsorships and venues, write match reports, add video and much more. Premier is a premium sports WordPress theme with a unique and professional design, packed with advanced features and functionality. The theme is from ThemeBoy – a company that specializes in advanced WordPress products for the sports community. All the core sports functionality in the theme is provided by the free SportsPress WordPress plugin (built by ThemeBoy). Some of the key features and functionality of the theme include: a custom widgetzied homepage (ideal for displaying league tables, fixtures, results, player lists etc), modern flat design, custom header with full width image, custom posts slider, countdown widget, beautiful fixtures and results with a scoreboard like format, awesome custom player profiles, league tables, lists and event calendars, and more. The theme has a responsive design so its mobile friendly and will work perfectly on all devices. 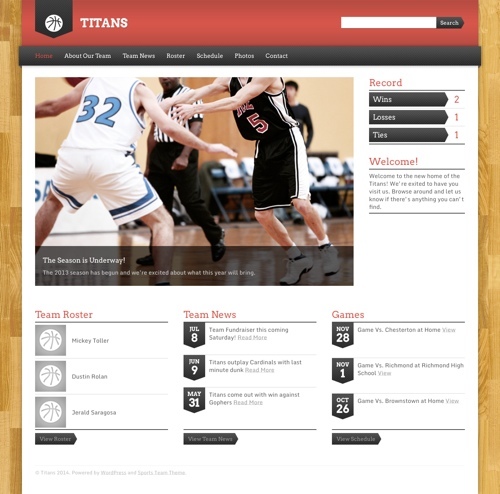 My Club Site is a responsive WordPress theme that allows you to create your own sports team website. The theme could be used for any type of sport and includes a heap of great sports functionality including: player profiles and stats (profile pages for each of your players complete with Photograph, Personal Info, Playing Stats, Fans Rating and more), full fixture control (displays your fixture list, recent form, results and next/last match information dynamically), live match coverage (live match text-commentary complete with scorers, team line-up’s, video support and even embed your favourite Tweets), photo gallery, fans forum, YouTube video section, social networking support, advertising options for revenue, theme control panel and more. The theme is mobile friendly with a responsive design so will look great on tablets and all mobile phones. 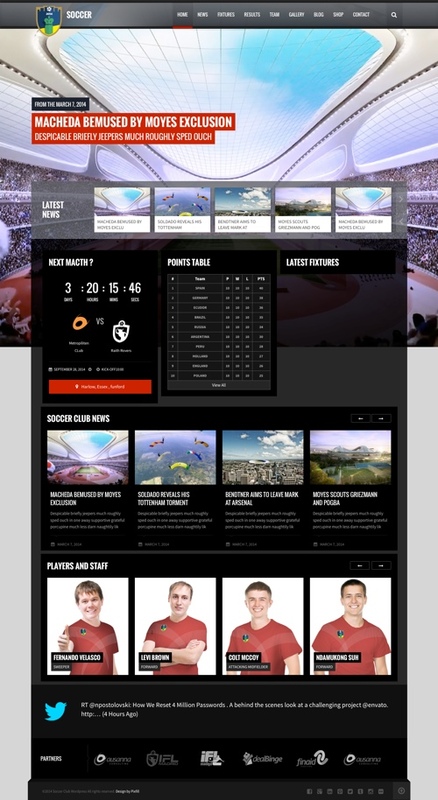 Real Soccer is a responsive sports WordPress theme designed specifically for football, soccer and sports clubs. The premium theme has a modern and visually appealing design that is mobile friendly and works perfectly on tablets and mobile phones. 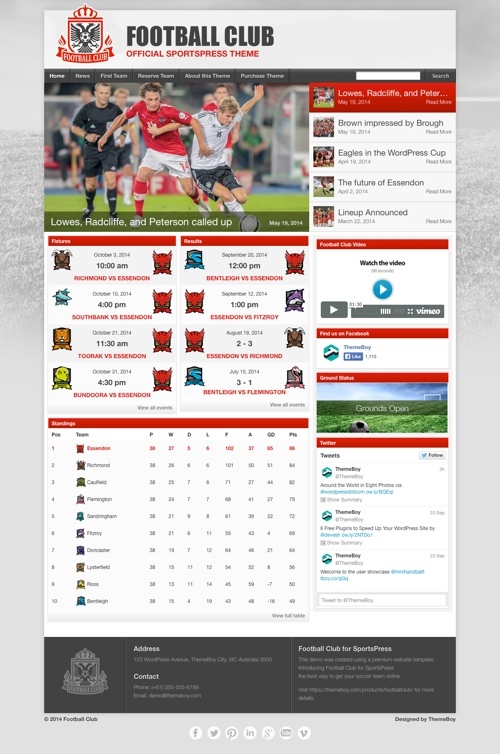 Some of the notable features of the theme include: player profiles and player lists, a league table, fixtures and results, match report page, a big featured slider, parallax effects, custom unlimited colour scheme options, page builder, Google fonts, mega menu system, various layout options, theme customizer and more. The Equipo theme is a responsive WordPress theme designed for sport teams, football teams, basketball teams, and other sports teams. The theme has a custom homepage design with a featured background slider and sections to display match results, news, league table, videos, player profiles, latest tweets, blog posts and more. Some of the other features include: an intelligent options panel, typography options, localization and language options, shortcodes, custom backgrounds, events and team post type, photo gallery, and more. Ambition is a WordPress theme for sports people to show off their skills, talents, achievements, events, videos and more. The premium theme from Obox Themes has a unique layout and lots of custom sections to show of your talents. It has an events section for events you’re going to or hosting, an achievements section to list all your achievements in different categories, spots for sponsors, and galleries for your photos. You can also upload video and audio. The admin option panel in the backend lets you easily manage and customise your site and you can update the look and feel of your theme through a visual preview window. Ambition also has a mobile responsive layout so will automatically adjust to look good on mobile phones, tablets and desktops. Osage is a feature rich and versatile magazine WordPress theme with a modern and mobile friendly design that could be used for any genre of magazine or news website. The theme is ideal for sport magazines or sport league websites as it comes with an optional custom built scoreboard. Some of the other notable features of the premium theme include: three different ad units including a custom wallpaper ad, over 600 Google Fonts, a Featured Slider on each category page, Infinite Scrolling, a “sticky” menu bar and sidebar, post/page slideshows, compatible with WooCommerce and bbPress, video and audio post support, dynamic sharing buttons, unlimited colours, Google Authorship, rich snippet and more. 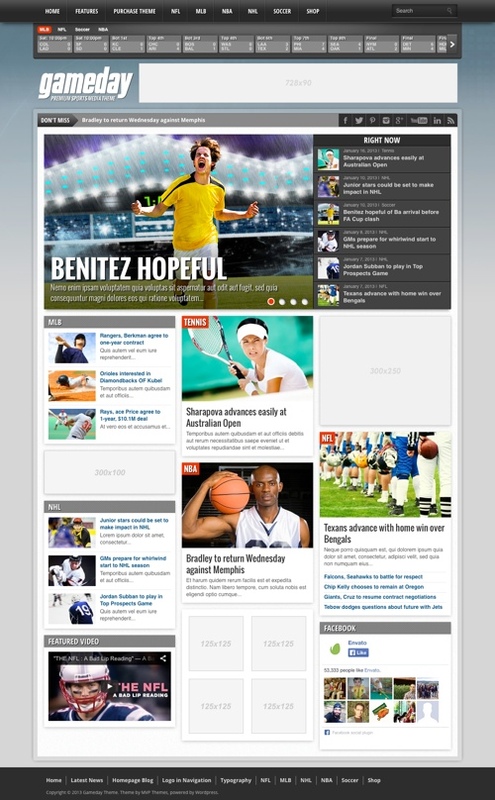 The Club Sports WordPress theme has been designed for sports news websites, sport clubs and sporting event websites. The premium theme has a professional looking homepage layout that allows you to display a lot of content and information. It has some nice sports functionality including: points table management, fixtures and results management, team management and players pages, and points table. Some of the other features include: WooCommerce ready, an advanced page builder, unlimited sidebars, HTML5 and CSS3 coding, full color customization options, mobile responsive layout, Font Awesome icons, advanced options panel for easy management and more. Sport Press is a premium magazine WordPress theme from WPZOOM ideal for sport magazine websites. The theme includes a comprehensive options panel for easy setup and customization, featured slider and multimedia carousel, custom menu management, and multiple layout options for either a magazine or traditional blog structure. Sporty is a premium WordPress theme for any sport club – football club, cricket club, hockey club, baseball club, rugby club, basketball club, and others. The theme has a fairly simple but unique blog magazine style. The theme is mobile responsive so will work on tablets and all mobile phones and other devices. It comes with a custom fixtures and results plugin. Other features include: a powerful admin panel, unlimited colours, Google fonts support, unlimited league / cup tables etc with Tablepress, featured slider, custom widgets, grid galleries, multilingual ready and more. 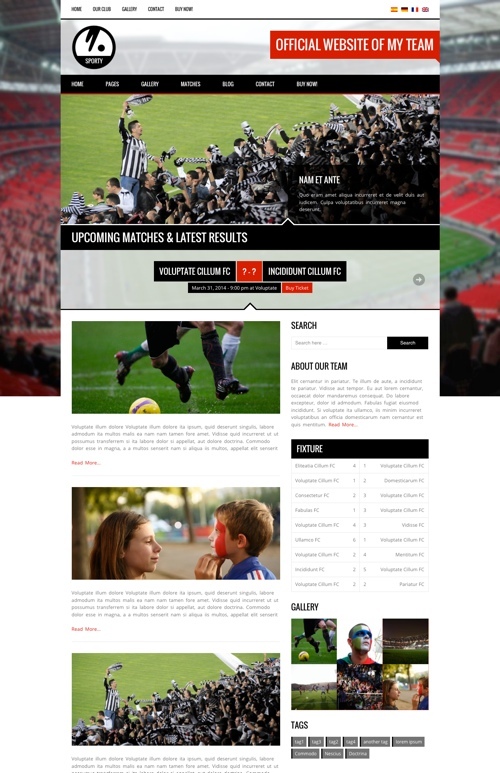 The Soccer Club WordPress theme is for sports clubs and sporting events. It has a custom homepage with full screen background slider and sections for all the latest sporting fixtures / results and information. The premium theme includes specific sports functionality including: a points table, manage fixtures and results, team management, and player profiles. Some of the other features include: an advanced page builder, WooCommerce ready, unlimited sidebars, full color customization, stick header, options panel, blog and news section, RTL language and translation support and more. The theme is built with HTML5 and CSS3 and is 100% responsive for mobile devices. 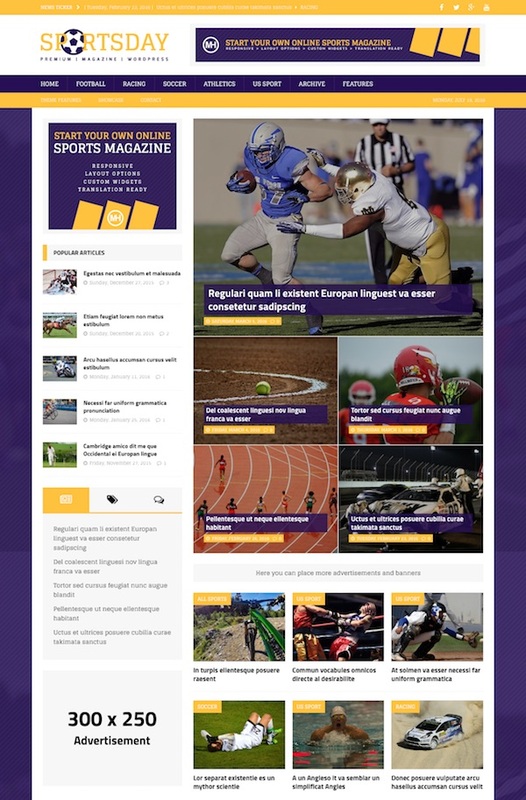 Sportsline is a mobile responsive sports news WordPress theme. The theme has a magazine / news design that lets you display a lot of articles from different sport categories on the homepage. It has custom post types for match results for the latest sport results and another for match fixtures. Some of the other features include: two homepage variations, photo gallery, admin options panel, RTL ready, custom widgets, Google fonts support, shortcodes and built with Bootstrap 3, HTML5 and CSS3. Sportimo is a responsive blog magazine WordPress theme suitable for sport blogs, newspapers and magazines. It has an event countdown timer, custom event page and a results page. Some of the other key features include: a visual composer page builder, lightbox style photo gallery, custom shortcodes, unlimited sidebars, banner advertising system, Google webfonts, and more. 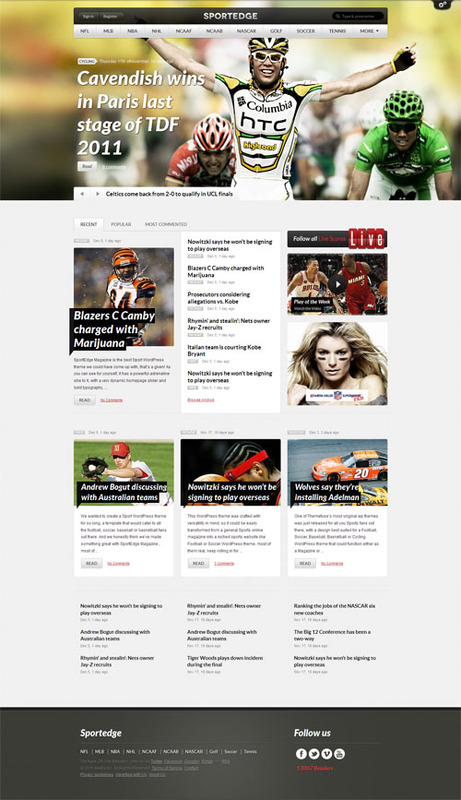 Gameday is a responsive sports news and magazine WordPress theme with a heap of features. It has a professional looking design and the layout automatically adjusts to the device on which its being view on. 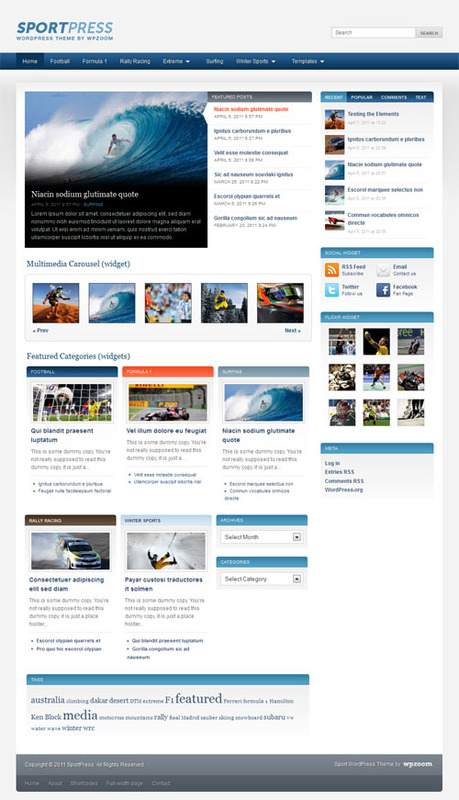 Some of the notable features in the theme include: a custom built scoreboard, WooCommerce and bbPress integration, a drag and drop homepage, a slider on each category page, 4 different ad units including a wallpaper ad, fly-out mobile navigation menu, audio and video posts, unlimited colour options and more. 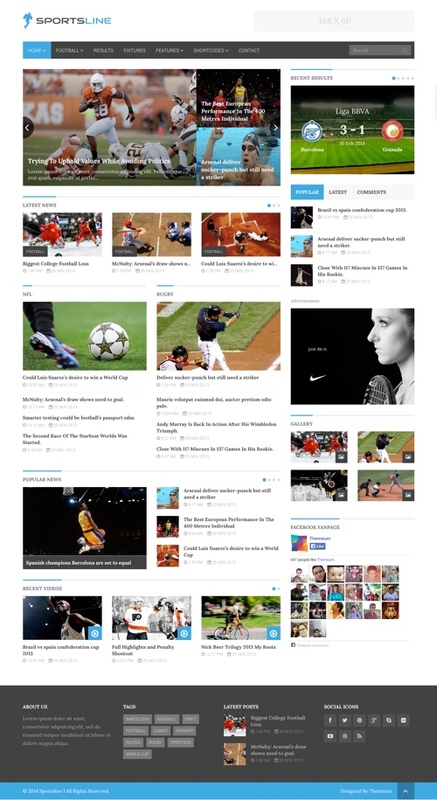 Resportsive is a sports news WordPress theme with a responsive design. While the theme is a bit dated and doesn’t have any specific sports functionality the design is intended to look like a major sports news outlet. Some of the notable features in the theme include: a drag and drop homepage, custom widgets, featured headline and content sections, news ticker, easy logo integration, featured slider, and more. The Sports Team WordPress theme is made just for sports teams. The theme has a simple and responsive (mobile friendly) design that will allow you to quickly and easily create a website for a sports club, little league, youth, adult or school sports team. Some of the key features of the theme include: team roster (list your players, jersey numbers, positions, photos, and custom fields), team schedule (dates and times, cost to enter, location information, custom fields, and your team’s record), team news, photo galleries, customisation options (team colours, logo, backgrounds, fonts etc), roster display options, custom widgets, and more.